The sombre 'Sang' culture has struck a cord with dispirited Chinese youth weighed down by societal pressures and unmet lifestyle expectations. Beijing: Chinese millennials with a dim view of their career and marriage prospects can wallow in despair with a range of teas such as “achieved-absolutely-nothing black tea”, and “my-ex’s-life-is-better-than-mine fruit tea”. While the drink names at the Sung chain of tea stalls are tongue-in-cheek, the sentiment they reflect is serious. A significant number of young Chinese with high expectations have become disenchanted and embraced an attitude known on social media as “sang”, after a Chinese character associated with the word “funeral” that describes being dispirited. It’s a reaction to cut-throat competition for good jobs in an economy that isn’t as robust as it was a few years ago and when home-ownership – long seen as a pre-requisite for marriage – is increasingly unattainable in major cities with apartment prices having soared. Such ironic humour is lost on China’s ruling Communist Party. In August, Sung Tea was called out for peddling “mental opium” by the Communist Party’s official People’s Daily, which described sang culture as “an extreme, pessimistic and hopeless attitude that’s worth our concern and discussion… Stand up, and be brave. Refuse to drink ‘sung tea’, choose to walk the right path, and live the fighting spirit of our era” it said. While “sang” can be a pose or affectation, despondency among a segment of educated young people is a genuine concern for President Xi Jinping and his government, which prizes stability. The censorship clampdown in the run-up to autumn’s Communist Party congress, held once every five years, extends even to negativity, with regulations issued in early June calling for “positive energy” in online audiovisual content. Later that month, some young netizens were frustrated when Bojack Horseman, an animated American TV series about a half-man/half-horse former sitcom star, and popular among the “sang” generation for his self-loathing and cynicism, was pulled from Chinese streaming site iQiyi. A spokesperson at iQiyi said the decision was due to “internal process issues” but declined to give further details. Undermining “sang” may take some doing. “Sang” is a rebellion against the striving of contemporary urban China, no matter the cost or hopes of achieving a goal. Tied to that is intense social and family pressure to succeed, which typically comes with the expectation that as members of the one-child generation, children will support ageing parents and grandparents. Zhao’s online posts, often tinged with dark humour, have attracted almost 50,000 fans on microblogging site Weibo. Zhao turned the subject into a book last year: “A Life Where You Can’t Strive for Success All The Time”. While China’s roughly 380 million millennials i.e. those aged about 18 – 35, have opportunities that earlier generations would have found unimaginable, they also have expectations that are becoming harder to meet. The average starting salary for graduates dropped by 16% this year to 4,014 yuan ($608) per month amid intensifying competition for jobs, even as a record eight million graduate from Chinese universities – nearly ten times the number in 1997. Even among the elite “sea turtles” – those who return after studying overseas, almost half of the 2017 graduates earned less than 6,000 yuan per month, with 70 percent of respondents saying their pay is “far below” expectations. In contrast the median per person rent in Beijing, where most of the estimated eight million renters are millennials, has risen by 33% in the past five years to 2,748 yuan a month, equivalent to 58 percent of median income in the city, a survey by E-House China R&D Institute found. The spiralling costs mean that young Chinese workers have to live on the edges of cities, with long, stressful journeys to work. “Sang” contrasts with the optimism of those who entered adulthood during the years of China’s double-digit economic growth. That generation was motivated by career prospects and life quality expectations that their parents and grandparents, who had learned to “eat bitter” during tougher times, could only dream of. “Our media and society have shoved too many success stories down our throat…’Sang’ is a quiet protest against society’s relentless push for achieving the traditional notion of success. It is about admitting that you just can’t make it,” Zhao told Reuters. It is also a symptom of the lack of channels for frustrated young adults to vent frustration, a survey by the state think tank Chinese Academy of Social Sciences (CASS) found in June.”The internet itself is a channel for them to release pressure but due to censorship it’s impossible to do so by openly venting,” Xiao Ziyang, a CASS researcher, told Reuters. Sung Tea founder Xiang Huanzhong, 29, said he expects pressure on young Chinese adults only to grow, citing the aging of the population as a particular burden for the young. Xiang has capitalised on the trend with products named after popular “sang” phrases. 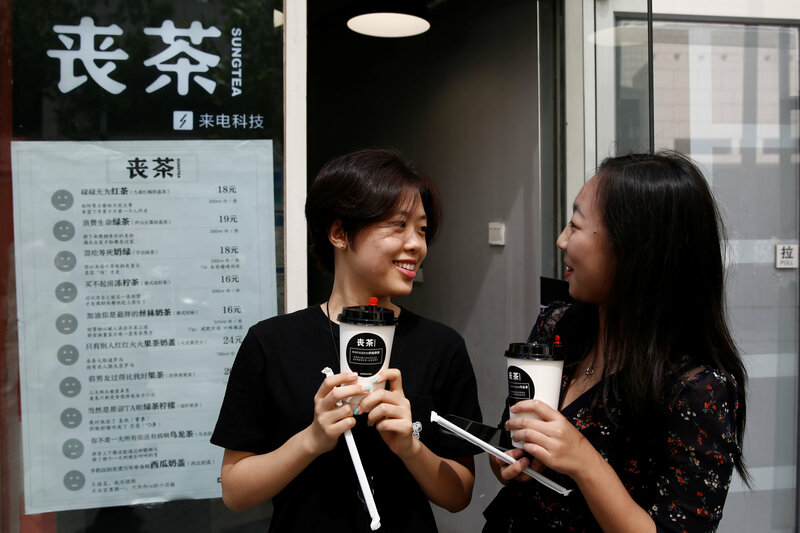 The chain, where a best-selling “sitting-around-and-waiting-to-die” matcha milk tea costs 18 yuan, currently has single locations in twelve cities after opening its first permanent tea stall in July in Beijing. Xiang said he chose tame names for his products so as not to attract censure from authorities.